Description: I FINALLY made it to my Machu Picchu pictures! It took me two years, but hey, I did it! In order to make it up to this magnificent view by sunrise, I woke up at 4am, along with two fellow travelers. We were out the door at 4:30am and RAN up the steep steps (not sure how far it is) in 1hr 10min. We arrived at the gate to enter Machu Picchu where there were probably another 20 or so people already there. At 6am, the gates opened and we were the 2nd, 3rd, and 4th people through the gate! We setup camp and took a few initial pictures until it got crowded. 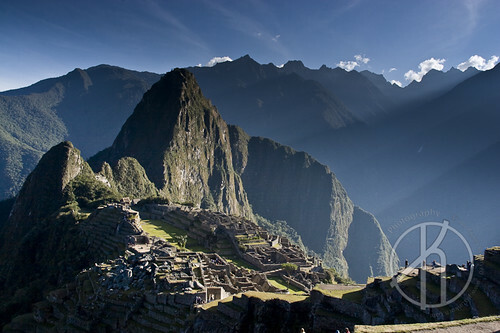 We then moved to a new spot where we watched the sun come over the mountains and shine upon Machu Picchu. It was absolutely amazing! You can find a few more of my pictures of this amazing city on Flickr.